Don’t you hate it when you just can’t find something? Your car keys? Your cell phone? Your stalker? She’s not back there. Where the heck is she? There she is! I think I’m gonna have to get a restraining order. 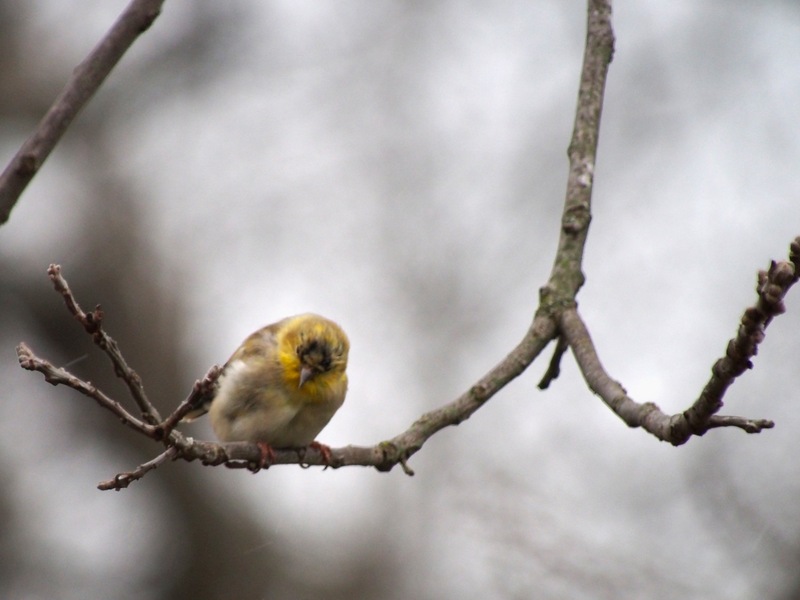 This entry was posted in birds, Ozarks, Photography, wildlife and tagged American Goldfinch, Arkansas, birding, birds, humor, Olympus, Olympus E-M5, Ozarks, photography by artsifrtsy. Bookmark the permalink. Great photos mate… great photos..
Stalker indeed, but isn’t it a lot of fun being The Stalker. 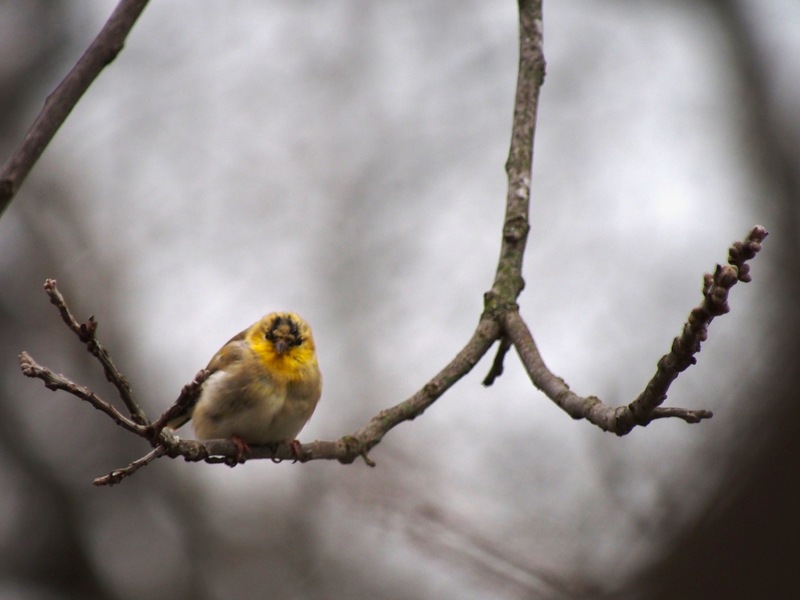 With all the extra snow, I’ll bet your feeders and seed are in great demand this season. This guy was waiting on me to refill the seed feeders – they were eating like crazy in between flurries. haha be assured that I will continue to stalk you via your blog! I live on a farm and as you can imagine, we have a big variety of birds. Great photos! Thanks – Do you feed them? I am on a few acres in the woods so I get a lot of migratory birds, but tons of songbirds. I do feed them, but it’s getting difficult. I have goldfinch feeders, but the mockingbirds are building nests and they are trying to run them off. I have 4 beautiful cardinals, but the other birds keep them farther out in the yard. I’m lucky to have a lot of birds who share – downs, finches, chickies, titmice – the cardinals are the most fleeting – I place plated out for them, and I scatter a bit of seed on the ground too. They won’t push for access though. Great! We’ve currently got Pied Wagtails (lots of them) and all of them protest when the camera come out! Now I know why…! It’s a word if you say so 🙂 The goldfinches are more interested in the feeders than they are afraid of me. Too cute!!!!!! Love the stalker angle. Thanks – I am a bit of a bird stalker. Ha! Mr. Craves was grilling Saturday evening and he had an audience of quail sitting on the fence – priceless:) Have a Great Day! I love quail – so sweet. You have a great day too! I bet it feels pretty good 🙂 I took these on Saturday or Sunday when it was spitting snow – they were all puffy in the tree waiting for me to refill those feeders. Yeah – I am ready for warm sunny days too – We haven’t had cold weather in so many years, I’ve forgotten how to deal with it! going out in a bit to see if I can catch a pic of the moon – so pretty last night but didn’t charge the camera battery – duh. I tried to shoot it night before last while it was in the clouds but was too impatient – hope you get a good shot!